Be sure to check out the McMahon Five Designs Blog to see all the rest of this week's new releases. And while your at it, check out my fellow Design Team Members creations too: the links to their blogs are listed in my side bar. Hi Amy, Your card is gorgeous. You did a fabulous job with this gorgeous image. I love the colors and your dp is a perfect match. 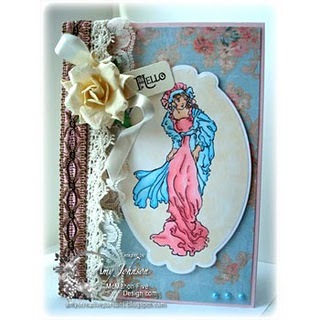 I love this pretty card- love the colors and that flower and the lace is an awesome touch- love the sentiment tag too!